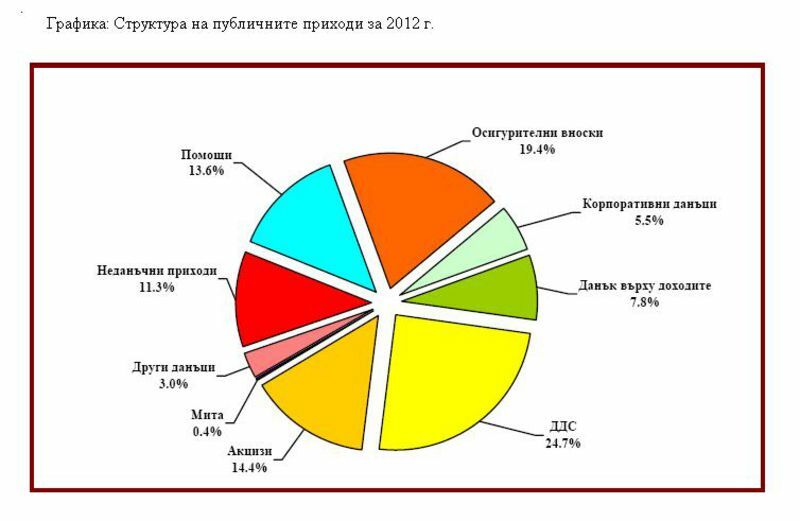 Next year's budget of Bulgaria is the same as this year's – small deficit, high spending for pensions and zero creativity. Obviously the government is reinsuring itself against potential risks, so the first criticism of the budget was that it was too conservative. However, there are still serious risks for its implementation, associated with deterioration of the global economic situation, the slowdown across the EU and the eurozone debt crisis. Against this background, the forecast for 2.9% economic growth seems too high, although it has been corrected downward from the initial assumptions for growth between 4 and 4.5%. With deficit of 1.3% of GDP (or about 2 billion BGN or approx. 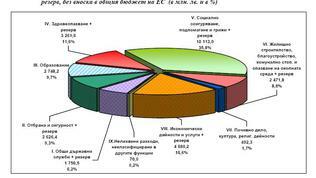 1 billion euros) Bulgaria will continue to be among EU's best performers, according to this indicator. Amendments have been made in the State Budget Act, approved by Parliament in the summer, fixing a ceiling of 2% of GDP on the budget deficits on a consolidated basis (1.3% in 2012 Budget) and limiting the redistributive role of the state by limiting the costs up to 40% of GDP (36.5% of GDP in Budget 2012). These are two elements of the so-called Financial Stability Pact (FSP) proposed by the Ministry of Finance in response to the commitment of our country under the Euro Plus Pact for the introduction of the so-called debt brake into national law. The third element of the FSP - direct taxes to be increased only by a majority of two thirds of MPs - should be enshrined in the Constitution, which is to be debated in Parliament. 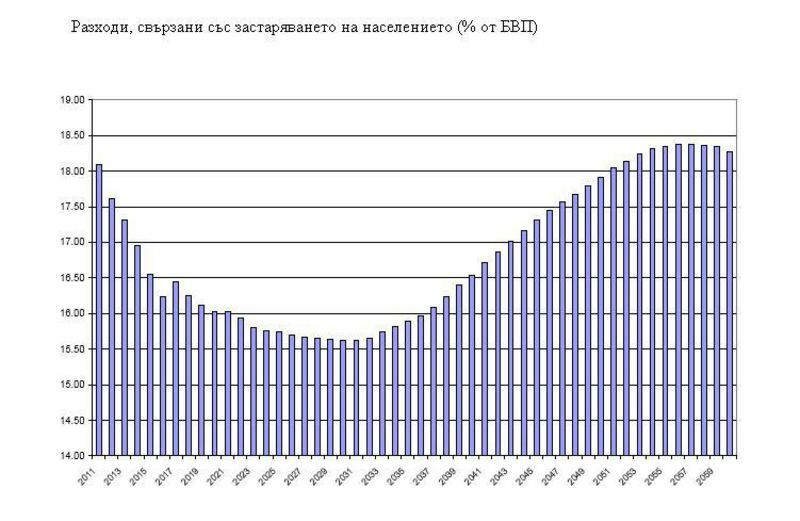 In 2012 the government expects budget revenues to amount to 35.2% of GDP or 28.7 billion BGN (14.7 billion euros) and the expenditures - 36.5% of GDP or 30 billion BGN (15.4 billion euros). The minimum amount of fiscal reserves remains 4.5 billion BGN (2.30 billion euros). The maximum amount of debt at the end of 2012 should not exceed 15.3 billion BGN (7.8 billion euros) or 18.7% of GDP, as on 31 July 2011 the debt amounted to 10.5 billion BGN (5.4 billion euros). The projected inflation is 2.8% and the expected foreign direct investment amount to 2.8% of GDP. The risks to the implementation of the budget are related to the instability of global economy, the drop of domestic and external demand, and related revenue failure. Amid the continuing debt crisis, threatening to transform into a banking crisis, there is also a risk of potential need for capital support of the banking system, which "is unlikely, but the risk is not insignificant considering the large amount of potential capital support." There are also no surprises in the breakdown of expenditure by sectors, but some negative trends are clearly visible. 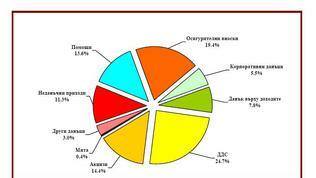 Again, the largest share belongs to the social sector - 10.113 billion BGN (5.17 billion euros) or 35% of total costs. There is an increase of 377 million BGN (193.3 billion euros) compared to last year. 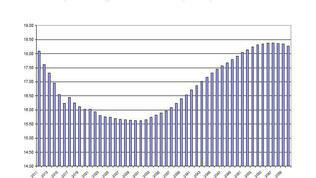 Only the costs for pensions, under the Social Security 2012 Budget, are 7.27 billion BGN (3.72 billion euros), 238 million more than 2011 budget. These figures are an eloquent proof of how ageing is a serious threat to public finances, thus underlining the need for real pension reforms. The report, accompanying the 2012 budget, notes in this regard, that from 2012 "the length of employment of the workers in third category of labour will increase smoothly by four months each year until reaching 37 years of service for women and 40 years of service for men in 2020". To see, however, whether the government has underpinned the budget figures with concrete measures and reforms, it is good to have a look at two other key documents - the Convergence Programme and the National Reform Programme. Within the European semester, together with the budget plans these were assessed by the European Commission and the other EU Member States, and appropriate recommendations were made, as euinside wrote in details. According to this assessment, "the pension reform decided in 2010 is not linked to life expectancy or to the situation of the health and long-term care system." Obviously the government is fully aware of the risks, so the only explanation for the lack of decisive action is populism. By the same token, just around the second round of the presidential and local elections, the government proposed to increase the minimum wage in 2012 from 270 BGN (138.5 euros) to 290 BGN (148.7 euros), which is not mentioned in the draft budget. The report, accompanying 2012 budget, notes that "increasing the income of employees is associated with intensive and consistent structural reforms and better linking of the labour market with the educational system to increase productivity and competitiveness of the economy." In this sense it is curious to see that the crisis has achieved what any government measures failed to - because of the unemployment (11.5% average for 2011) labour productivity grew by 6.4% in 2010 and 5.6% in the first six months of 2011. As a result, unit labour costs fell by 7% in the first half of 2011. Linking the increase of wages with labour productivity is also among the commitments Bulgaria made under the Euro Plus Pact. The risk, as the Commission notes, is unemployment to become structural, as particularly dangerous is the tendency for high unemployment among young people - Bulgaria has the highest proportion of young people who neither study nor work - 19.5% of the people between 15-24 years of age. In this context, the good news is that the spending for education in 2012 budget has increased by over 172 million BGN (88.2 million euros) to finance priority measures in the secondary education - introducing a new model of financing for primary and secondary schools, all-day training for second and third grade students, and mandatory pre-school for 5 year olds. It remains to be seen whether the more money would give better results. 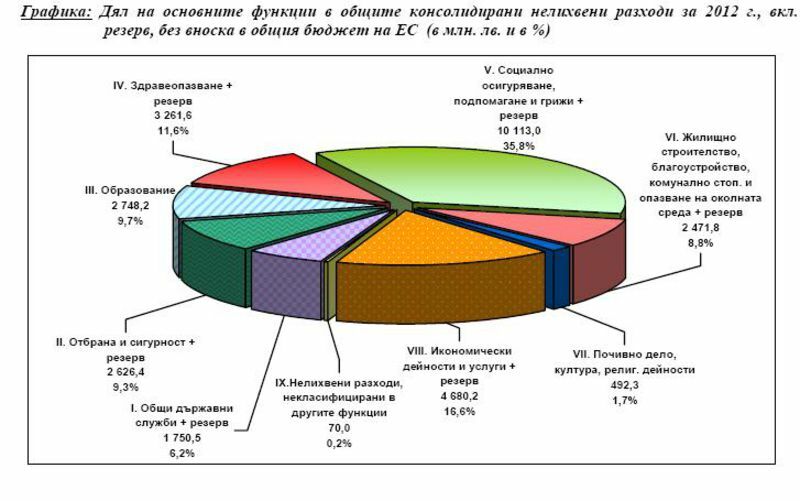 As for the statements that more money are envisaged in the 2012 budget for culture and education, and less for the Interior Ministry, the figures show: 2.7 billion BGN (1.38 billion euros) for education and 2.6 billion BGN (1.33 billion euros) for defence and security. The budget only of the Interior Ministry is still close to 1 billion BGN, as there is a symbolic reduction compared to last year. As for the economy, the second largest item in the budget after social expenditures are those for economic activities and services - 4.67 billion BGN (2.39 billion euros), which is 5.7% of GDP or 16.2% of total costs. Compared to last year there is an increase of almost 1 billion BGN, 884 million BGN of which is directed to transport and communications. This clearly shows that highways remain a top priority for the government. Along with this, it relies on better absorption of EU funds and on this basis the capital expenditures are increased by 43.8 percent to 5.24 billion BGN (2.68 billion euros). Now the budget is pending approval by Parliament. However, the procedure is long and begging of various parties for more taxpayers' money has already begun. Who will be able to bargain for more will become clear by its final adoption. But even then, as we have seen before, it is possible to see surprising gestures of handing out public money to the most vocal and persistent beggars. And whether we call it a pie or a pizza the budget will still be insufficient while desires are more than resources and until money for pensions and social benefits is more than the investments in the economy. For this purpose, the government must finally implement, as recommended by the Commission, "true and profound reforms for public finances strengthening."